What is the Ideal Placement Scenario for your Wi-Fi Router? To enjoy the best possible online experience, your router needs to be able to send out a strong signal to your wireless devices, wherever you are in your home. In general, the signal gets weak­er the farther you are from your Wi-Fi router. If possible, you should place the Wi-Fi router on a shelf. The ideal position is half-way between the floor and the ceiling. 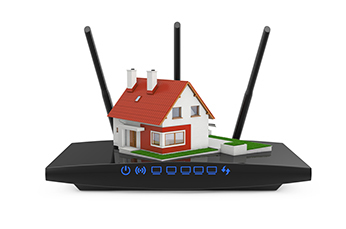 The physical features of your house may also contribute to Wi-Fi coverage issues. For example, walls made from concrete or brick, or with steel studs behind the drywall, can block some — or all — of your Wi-Fi signal. Metal surfaces can also weaken your Wi-Fi signal, so placing your router in a kitchen or laundry room (where there might be a lot of metal appliances) is not a good idea. Finally, one of the most obstructive materials for Wi-Fi signals is a mirror. If you have a sizeable mirror near your Wi-Fi router, it may negatively impact Wi-Fi performance. If you are experiencing Wi-Fi issues, try moving your Wi-Fi router to a different room in your house. Or, consider adding PMT MiHome to improve the coverage to all areas in your home.